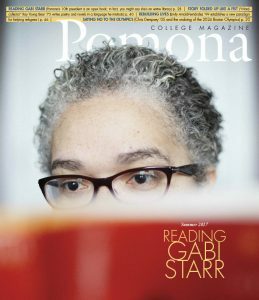 I was recently visiting my mother (Mayrene Gorton Ogier ’49) in Atascadero, Calif., and noticed the cover photo of the Spring 2017 issue of PCM depicting Pomona’s first Black graduate, Winston Dickson 1904. The magazine was doing secondary duty under a flower pot, but the water-stained photo nevertheless looked familiar. And indeed, it depicts Dickson boxing with my great-uncle, William Wharton 1906. 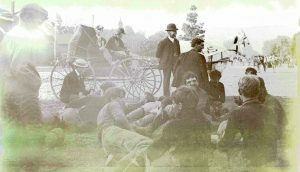 Then, inside on pages 28 and 29, was a wonderful double-page photo spread of Dickson a year and a half after his graduation, socializing with the 1905–06 Pomona College football team—evidently relaxing and recounting plays following a hard-fought game. (In those years, Pomona routinely beat USC, among others.) The gentleman immediately in front of Dickson in profile with his back to the camera wearing a disheveled suit coat is very likely Seaborn Wharton 1901, who stayed on at Pomona as football coach for a number of years before returning to Tulare, Calif., to manage the family farm. The two gentlemen sitting in the dirt talking with Seaborn and Dickson are almost surely William, who was team captain in 1906 and strikingly handsome, but who tragically died in a mining cave-in soon after graduating, and likely, Charles Greene (Charley) Wharton 1907, my grandfather, who later became a urologist in the Sierras silver-rush town of Bodie, Calif., and then in downtown Los Angeles, after graduating from medical school at Bowdoin. All three of them were distinguishable from their Pomona mates by their six-foot-plus height and wild curly hair—as was their sister, Minnie 1902, who taught school in Pomona and was vice president of the Pomona Alumni Association after World War I. If I knew how to communicate with those Whartons now, I would ask about Winston Dickson, as per the wishes of the hosts of the “Hidden Pomona” podcasts, who had little information to work with aside from old photographs. The Wharton family surely knew him very well. By the way, that early 19th-century Wharton family “thing” about Pomona College (the entire family moved to Claremont for a decade so the children could attend) has persisted. If my children had matriculated at Pomona as I hoped they might (they chose Princeton and Occidental instead), they would have been the 31st and 32nd extended Wharton/Alexander/Ogier/ Gannon/Wyse/Wiederanders family members to do so (counting also my father, Walter T. Ogier, who chaired the Physics Department for many years). To further the Pomona cause, my grandfather, Charley Wharton, and my grandmother, Aileen, in addition to being substantial direct donors to Pomona during their lives, also contributed financially and otherwise to the successful passage through Pomona of my siblings, Thomas Ogier ’82 and Kathryn Ogier Lum ’88. How I managed to miss Pomona’s siren call is not clear. I’ve been meaning to write since reading the touching, inspiring article by Carla Guerrero ’06, “I Do Belong Here,” in the Summer 2017 PCM. Then, this week, President Starr asked us to write our Pomona stories to her, and I responded. It was only right that I also write to you, for it was Carla’s story that inspired me to be in touch with Pomona College again after over 60 years. In 1952–54 I was a freshman and sophomore at Pomona College. As the only Japanese American in my class (there were two other Asians—no Blacks or Latinos) and coming from an immigrant, working-class family in Los Angeles, I was very aware I did not fit at Pomona in terms of race or social class. I was even invited to join the International Club. I suppose the well-meaning people who invited me did not understand that people of color were not necessarily born outside the U.S. Your story, the information that more than 50 percent of this year’s new class are domestic students of color and President Starr’s appointment fill me with joy. Pomona has always been a fine academic institution. I’m glad it is also moving toward being a welcoming home for multicultural students who reflect the current demographics of our country. Congratulations and thank you to Carla and others who were part of the wise group of people who brought President Starr to Pomona College. I was very touched by Carla Guererro’s column in the most recent PCM entitled, “I Do Belong Here.” I graduated from Pomona in 1998, and as I read her piece, I was transported back to my days as a student. I could completely relate to her experience as an awkward first-gen Latina daughter of proud immigrant parents trying to find her place at Pomona. Like Carla, I found a good group of peers, and with the support of wonderful faculty and staff, I thrived. The excitement she described at the hiring of Gabi Starr as Pomona’s new president is felt well beyond Claremont. I’ve talked to many of my Pomona friends, and we all agree—we’re so very proud of Pomona and can’t wait to see how President Starr will influence and inspire the entire community. Thank you, Carla, for writing a piece that truly captured not only a shared experience of the past but also a shared enthusiasm for the future of the college we love. I enjoyed reading the article titled “How to Understand the Mind of a Psychopath” in the Summer 2017 PCM. I was impressed with 2017 graduate Kaily Lawson’s view on cognitive science and what goes on inside the mind of what many consider to be a “serial killer.” I found it interesting that many prominent figures in today’s society have traits found in psychopaths. Once again, I enjoyed reading this article, and I hope Ms. Lawson finds success in her future career. I also wish her the best in her efforts to influence public policy in today’s legal system. The summer issue of PCM contains three letters from readers shocked by the simplistic right/wrong mentality of the modern occupants of Pomona College. I studied philosophy with Fred Sontag and W.T. Jones in the ’50s and sang in the glee clubs. But for the last 15 years I have been a student of Sanatana Dharma, the timeless path of the ancient riches in India. Before that I was interested in Chinese thinking for decades. My background leads me to see what is going on at Pomona as an extreme form of individualism in the still-adolescent culture that is the United States. What we need today is the ability to open our hearts to everyone and use our minds to try to understand what our hearts tell us about others. Pomona is of course a bookish place. I take issue also with the idea that climate change is the major issue. Doris Lessing’s futuristic novels suggest what the world might look like after catastrophe: They are lost but surviving. However, I would say that the major issue is the fallout from unregulated socially irresponsible capitalism and our apparent inability to live together in a crowded landscape without resulting in wars between city blocks scaled up to nations. There are so many good people in America, although one might think money is the main value for most people. So I also hold the thought that Trump may save us yet by pushing us so close to self-destruction that we may suddenly experience a mass epiphany and find in our midst unknown new leaders who can lead us, hopefully without too much humor about how foolish we were to be taken in by our dogmatic old beliefs. I hope certain letter writers in the Summer 2017 PCM learn someday that what they call “political correctness” is simply treating those different from them with basic dignity and respect. They should try it sometime. They might learn a few things that four years at Pomona evidently failed to teach them. In your obituaries in the Summer 2017 PCM, you listed Robert Shelton as Robert “Bob” H. Shelton ’47. He was always known as “Robin” Shelton at Pomona. I should know because I married him.